Some posts are all about the pretty photos, and this one is not. Weeknight dinners these days are a little simpler and a lot quicker than they used to be. With a four month old, we are still trying to figure out whether it's worth fitting in a quick supper while she is doing a catnap in the swing (around 6:15) or whether we hold off until she is down for the night (around 8). Waiting until later is definitely easier and more fail-proof, but some days I am just plan HUNGRY and ready to eat sooner! Ian purchased these steaks for us, which explain their scary mammoth size. I got through a little less than half of mine and then used the leftovers as sliced meat for wraps the next three days. I love, love, love roasted okra -- I just toss it in olive oil and add salt and pepper (ground cumin is also excellent on them) and then roast at a high temp until crispy. The cool thing about this okra is that it started off in a frozen bag, and I thawed it in a colander in the sink. I wasn't sure if the consistency would be right, but our grocery store had large bags of it for just over a dollar so I figured I'd give it a shot. Worked perfectly, tasted the same as when I use fresh okra! The peach salad had sliced peaches, blueberries, red onion, feta, basil, mint, red wine vinegar and a splash of olive oil. Mom was in town and we cooked these cornish hens for several hours in the Crockpot and then broiled the tops at the end to get them browned. We just simply rubbed them in olive oil and spices and topped them with a slice of prosciutto (which I removed while they broiled and then replaced). The white beans are just Great Northerns which I simmered with fresh rosemary and a little olive oil, then mashed until creamy. The salad was a simple one with greens, feta cheese, sliced strawberries, red onion, and a homemade balsamic dressing. 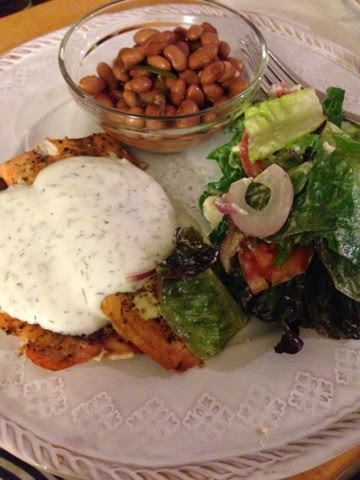 I baked salmon filets until flaky and served them with a dill yogurt sauce (dried dill, plain yogurt, lemon juice, salt, pepper). The pintos were simmered with fresh rosemary. The salad had greens, red onion, tomato, goat cheese, and a homemade citrus basil vinaigrette. I just mixed lemon juice with olive oil and a pinch of salt, added in a few fresh basil leaves to a mason jar and let it all marinate together. This is how we eat! Either 2-1 veg-protein or 2-1 protein-veg. Quick, delicious, filling. I've also been doing a lot of bulk salad prep -- rinsing and cutting all of the components on Sunday, leaving them in separate bags/containers until we're ready to assemble and dress them. I need to try those mashed white beans you do sometime. I've actually, now that Shelby has a learning tower, have been able to master having dinner on the table by the time Brad walks in the door. Some of my go tos are: that stuffed tenderloin you do, spaghetti squash boats with grilled chicken, veggie spaghetti, and zuchinni squash boats. We also do salmon quit a bit and fish tacos. I will have to try that roasted okra! Sounds so yummy. I always love your recipe posts - I get some new and different ideas beyond our usual menu! Your recipe posts are my favorite - always creative and most importantly, tasty! Thanks for more great meal ideas. Yum! My husband would love these dinners! You call these easy but they look WAY impressive. 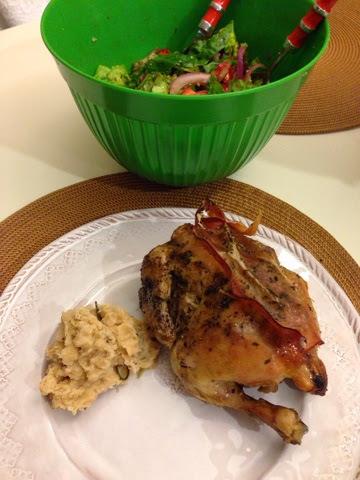 I would never think to make Cornish game hens...I need to try! I am sure I would love them, and so easy! Hah! We also utilize what we call the "swing nap" for dinner time, pretty much the only time we ever put Lawtie in the swing. 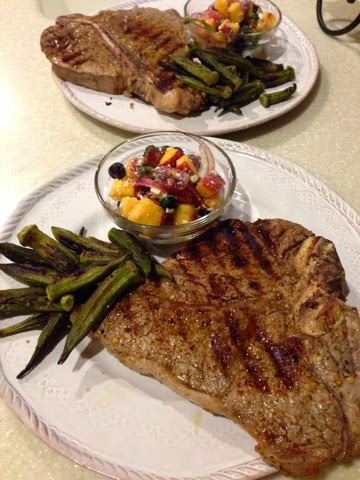 And yes, those steaks are ridiculous, and yes, my husband stands behind me and says the same when I snap pics of our dinners : ) hahaa Great recipes, I love new ideas! April, these dinners look beautiful! I am still trying to adjust my dinner meal style from smaller meals that have less/no meat to more meals with meat as the main dish as my boyfriend prefers and really needs more meat for dinners. So these are all look like great ideas for filling and healthy meals! Thanks! 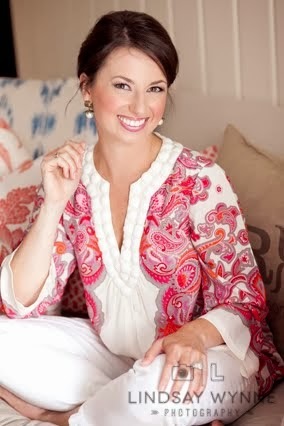 I always really enjoy your blog and your sweet baby girl! I hear ya! I would cook during Ellie's late afternoon nap and then seriously as soon as we say down to eat our food she would wake up, every time, without fail! And it didn't matter how long it took me to prepare. I think she had a sixth sense about these things. Your meals look delish and now I am seriously thinking I need to try okra! Be sure to check out my blog for two giveaways I'm hosting this month! I'm so impressed with your dinners! I think they all look upscale/gourmet while being simple and healthy! Right now, I'm stocking our fridge, so I've been making things like pulled pork and enchiladas, but it's inspiring to know it's still possible to get a nice dinner on the table! Your dinners all look amazing to me and I love that they're all fairly simple to throw together! I don't know why I've never thought to roast okra but that's going on the menu for next week along with those amazing mashed white beans! Have a great weekend! Omg, I could have written so much of this post. Word. For. Word. We struggle with the same thing--fit in dinner while the baby is in HIS "witching hour" (which is really more like two or three hours at night on most nights) or wait until he goes to bed at 8. Kindred spirits!! Or at least, going through the same things. :) Your "non fancy" pictures still look fancier than most! :) Have a wonderful weekend!